When electrons start moving in one direction, we say that electric current is flowing. Flow of electrons constitutes current. Water is a good example to explain current. When glaciers melt at the mountains, water starts flowing in one direction forming river. Similarly, if electrons start flowing in one direction, current is formed. Current is a measurable quantity. 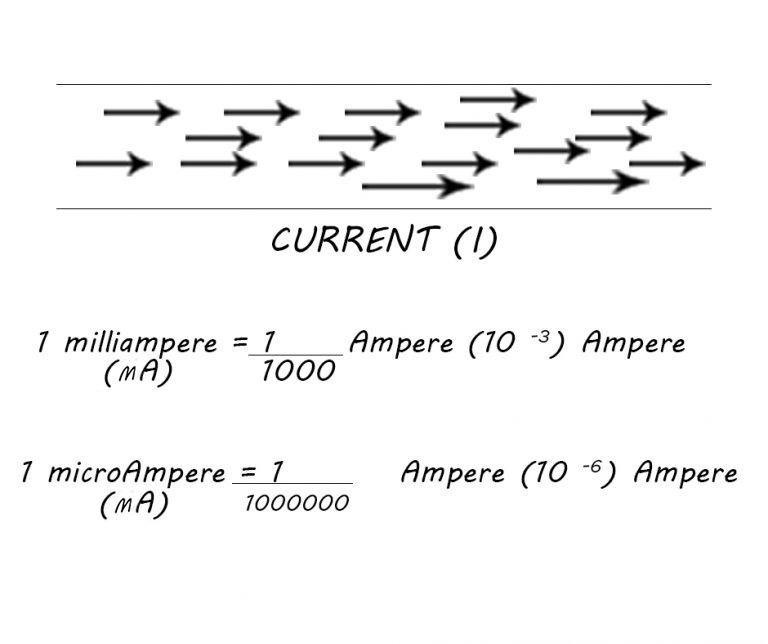 As length is measured in meters, current is measured in Ampere. 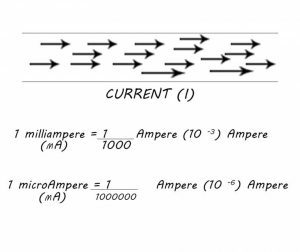 Smaller units of current are milliampere and microampere. The current is measured by Ammeter and is represented as I. For an electric current to flow, two conditions are to be met. Source of energy to make electricity flow that is a cell or battery. A complete path for current to flow. This complete path is called Circuit. A simplest circuit can be constructed using a battery, lamp and wires. 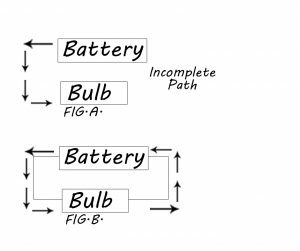 By connecting a single wire from battery to bulb (fig. A) will not light up bulb, for that another wire must be connected to the battery’s other terminal(fig. B). This makes path for electrons to flow back to the battery. This unbroken path is called a circuit. Electric current require this complete path or circuit to flow. The electrons flowing through the bulb are not used up by it. They just pass through the bulb and return to the battery. In a circuit with a battery, the battery is both the starting and ending point for circuit. Electrons are released from the battery due to chemical reactions, these electrons flow around the circuit and return back to the battery. The battery keeps the current flowing, feeding electrons at one end and collecting them other end. It takes energy to do this and so after a while the battery wears out. As current passes through the components of the circuit, things happens. I apologize for grammar mistakes, if any. to bookmark your blog and may come back later in life. reading throug your articles. Can you suggest any other blogs/websites/forums that cover the same subjects? Great article. Just what I was searching for 🙂 Nice job. with my website =). We will have a link change arrangement among us!
) I maihtain such information much. I used to be seeking thyis particulpar information for a very lengthy time. Haave you ever though about writing an ebook or guest authoring on other blogs? my subscribers would appreciate your work. If you’re even remotely interested, feel free to shoot me an e-mail. Tremmendous things here. I am very satiswfied to loiok your post. please drop mme a mail?